The Mamiya RB67 is a very successful line of single-lens reflex medium format cameras made by the Mamiya Corporation. Using the text or images on this website without permission on an ebay auction or any other site is a violation of federal law. The first model, the RB67 Pro, came out in 1970 and was made until 1974. They made some changes in it, renamed it the RB67 Pro-S and was produced until 1990. In 1990 they made further changes and renamed it the Pro-SD. The Pro-SD was still currently being sold new into the early 2000s. 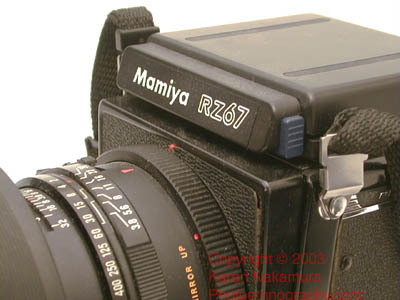 Mamiya also has a higher-tier line called the RZ series that features electronically controlled lenses and shutters. I modified my RB Pro to mount a RZ hood on it. This gives me the self-erecting feature, which is quite nice. The hood pops up and closes down almost automatically. And my camera says RZ67 on the front which confuses everybody. I get a lot of questions (see the comments section at the bottom of this page) about how I did this and whether other hoods would work. First, it's fairly easy to adapt the RB body to physically accept a RZ hood. There are mounting screws on the body that latch onto the hood. You just need to replace them with longer ones to accept the RZ hood. You won't be able to use RB hoods after this conversion, until you replace the screws again. Now, this will only make the hoods physically compatible -- there's no electronics between the RB body and the RZ hoods. Other than the quick erecting hood, I've never felt I needed the additional features of the later RB models. If I was to buy a replacement for my Pro, it would most probably be a Mamiya RZ67 II since those cameras can use all my RB lens and backs (with a G adaptor) and can also be upgraded to electronic shutters and aperture priority metering. However, the RZ bodies are plastic and while they're lighter, they're not as tough as the RBs. A good alternative would be a Hasseblad 500C/M which because of ebay and the digital exodus, now only cost about $1200 for the entire kit. Or a Pentax 67, which is even cheaper. Modifying the hood: I've gotten several e-mail messages asking how I made the modification. The RZ and RB hoods mount in essentially the same way except the RZ-body mounting pins are just a bit longer. You just have to unscrew the mounting bolts (tiny screws) on the RB and replace them with slightly longer bolts (I bought them at my local Ace Hardware, they're very small metric bolts). Save the old bolts and you can revert back if you ever want to. It's pretty obvious what you have to do if you have both an RB body and RZ hood. I no longer have either so I can't be more specific, sorry! Lenses: I originally bought my RB in 2000 with a 90mm non-C lens, which is only single-coated. I replaced it with a C-series lens, which have are multi-coated. The C lens is definitely better than the older non-C. I also have a C 180mm telephoto lens. I almost got a 50mm C lens for wide angle, but instead ended up buying a Hasselblad kit.The KL lens are the top of the line for the RB lenses, easily the equal of any other medium format lens series out there, even the Hasselblad. Some of the new KL lenses require the Pro-SD because they have a larger rear mouth. The original RB back is pretty lousy, it doesn't even have somewhere to put your dark slide. If you can get a RB Pro SD back, it's much better. It has the aforementioned dark slide keeper as well as a film tag memo keeper. I also have the Polaroid back, which is nice although expensive. 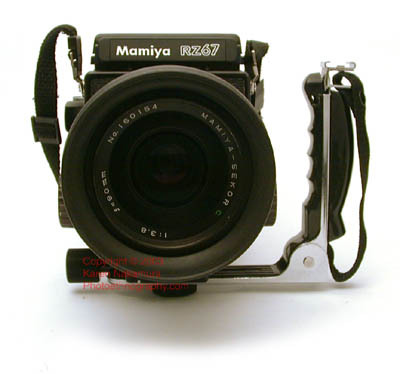 Mamiya RB backs are compatible along the entire series. You can use a RB-67 Pro SD back with a RB-67 Pro and vice versa. You can't use an RZ back with an RB camera, but you can an RB back on an RZ camera body if you buy the 'G' adaptor (which is fairly rare). I used an auxiliary handle to mount my RB to handhold it. If you're curious, I used a Really Right Stuff Arca-Swiss type quick release mount on the camera semi-permanently installed. I then used a Really Right Stuff quick-release clamp on the auxiliary handle. This let me quickly mount the handle, then take it off when I mount the RB on a tripod. The handle makes handholding the RB doable, but it does get tiresome. I usually just mount the unit onto a tripod when ever possible. It's definitely not the camera for street photoethnography unless you have very patient subjects and strong forearms. But it is quite nice for archaeological photos, material culture surveys, and other photos of things that don't move. For street photography medium format, the Pentax 67, Hasselblad, Koni-Omega or Yashicamat is a better idea. 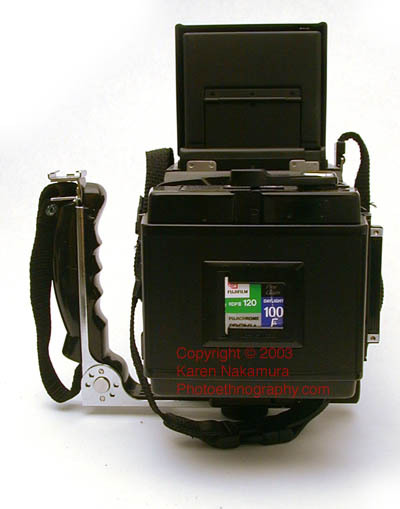 In June of 2004, I traded my Mamiya RB67 kit for some Nikon F equipment. I'm travelling in Japan and China and the Nikon F equipment is smaller and lighter. For medium format, I'm just left with my Pentax 67 and Hasselblad 203FE. The RB is unique in that it has a revolving back (RB = Revolving Back, get it?). This allows you to quickly switch between portrait and landscape orientations. This would otherwise require a cumbersome flip of the camera body and since the camera weighs 3 tons (in reality, 6 pounds), the RB feature is much appreciated (ask Pentax 67 users about how their forearms feel after shooting all day in portrait orientation). Because it has a leaf shutter instead of the massive, earth shattering focal plane curtain of the Pentax, the RB is particularly suited towards taking studio photographs. You can flash sync at any speed and when used in mirror-lockup mode, the RB is particularly quiescent in terms of vibration. The bellows focusing offers 46mm of extension, allowing for easy close-up photography. Although I have a set of extension tubes, they're really unneccessary with the standard lens and I only use them with the telephoto lens. All of this makes the RB/RZ system ideal for studio photography of small objects - such as food photography. New News: Mamiya announced in October 2004, that they have come out with a digital back for the RZ67-IID (a new digital-ready variation of the RZ-67) as well as an integrated digital medium format camera, the Mamiya ZD which boasts 22 megapixels. The Mamiya ZD appears to be based on Mamiya's popular line of 6x4.5 cameras and comes with interchangeable autofocus lenses. This is extremely exciting information. If the pricing is similar to the Canon full-frame digital camera, the Canon EOS 1Ds Mk. II at ~$8000, then this is earth-shattering news. 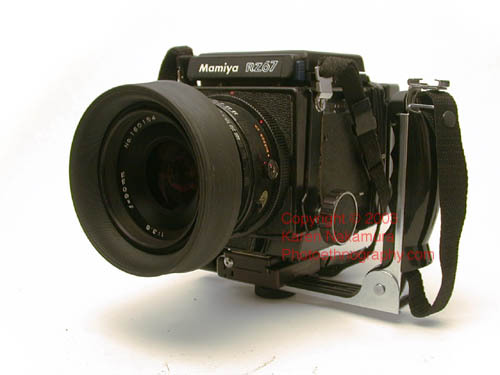 Don't sell your Mamiya RB/RZ or 645 system just yet! Hope is on the way! Copyright © 2005-11 Karen Nakamura / Photoethnography.com. Use of this chart, text, or any photographs in an eBay auction without permission will result in an immediate IP violation claim with eBay VeRO. Violators may have their eBay account cancelled. Scroll down to the very bottom of this page for comments and feedback! I would firstly congratulate you about your website. What a work! FINDER PRISM fit with an Rb67 Pro SD model? I don't have my RB anymore and I've never owned an RZ, but I don't think that it's possible. The reason is that I believe that the RZ Pro Metered AE prism derives its power from the RZ body. The conversion is only a physical one, the RB has no power to give to the hood. RZ's are now cheap enough on the used market, I'd suggest to not do the conversion and instead just get an RZ body.